“In the beginning God created the heavens and the earth.” Beginnings are important. If we want to understand the Bible as a whole, we must understand what it teaches about creation. Interpreting Genesis 1 has become controversial among “In the beginning God created the heavens and the earth.” evangelicals today. Because of this, W. Robert Godfrey has written this short, clear study with thoughtful Christians in mind. He understands that it can be difficult to take fresh look at a Scripture passage that is so familiar. 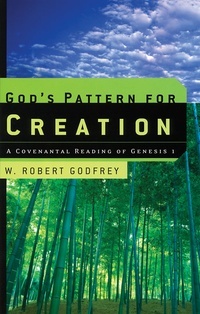 Godfrey encourages readers to come to Genesis 1 eager to find all that God has to teach us. Genesis 1 and 2 are true, historical accounts of creation. God created the earth for man, his image-bearer. Genesis 1 presents Gods days of creation as a pattern for man with six days for work and one day for rest. The days of Genesis 1 are not primarily about how God created. The Sabbath is a creation ordinance for man. Christians must believe what God has revealed about his work of creation.